In 1981 a native of Sierra Leone, Michael Samura, heard the gospel in Holland and was baptized there. When he returned to Freetown, the capital of Sierra Leone, he requested missionaries, but because the Church was not ready to send missionaries there, he was sent only Church literature. Brother Samura began teaching others and holding unofficial meetings. 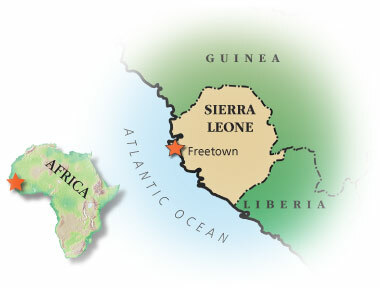 Members who had been baptized in other countries and had returned to Sierra Leone did the same. The year 1988 was a milestone for the country. In January the first official meeting was presided over by a member who had been baptized in Germany. In May two missionary couples arrived, and in June the first 14 baptisms in the country were performed. In August the first branch﻿—the Goderich Branch﻿—was established. Ground was broken in 2004 for the first Latter-day Saint meetinghouse in Sierra Leone.